The electron transport chain uses the electrons from electron carriers to create a chemical gradient that can be used to power oxidative phosphorylation. Oxidative phosphorylation is the metabolic pathway in which electrons are transferred from electron donors to electron acceptors in redox reactions; this series of reactions releases energy which is used to form ATP. There are four protein complexes (labeled complex I-IV) in the electron transport chain, which are involved in moving electrons from NADH and FADH2 to molecular oxygen. Complex I establishes the hydrogen ion gradient by pumping four hydrogen ions across the membrane from the matrix into the intermembrane space. Complex II receives FADH2, which bypasses complex I, and delivers electrons directly to the electron transport chain. Ubiquinone (Q) accepts the electrons from both complex I and complex II and delivers them to complex III. Complex III pumps protons through the membrane and passes its electrons to cytochrome c for transport to the fourth complex of proteins and enzymes. Complex IV reduces oxygen; the reduced oxygen then picks up two hydrogen ions from the surrounding medium to make water. prosthetic group: The non-protein component of a conjugated protein. complex: A structure consisting of a central atom, molecule, or protein weakly connected to surrounding atoms, molecules, or proteins. ubiquinone: A lipid soluble substance that is a component of the electron transport chain and accepts electrons from complexes I and II. Oxidative phosphorylation is a highly efficient method of producing large amounts of ATP, the basic unit of energy for metabolic processes. During this process electrons are exchanged between molecules, which creates a chemical gradient that allows for the production of ATP. 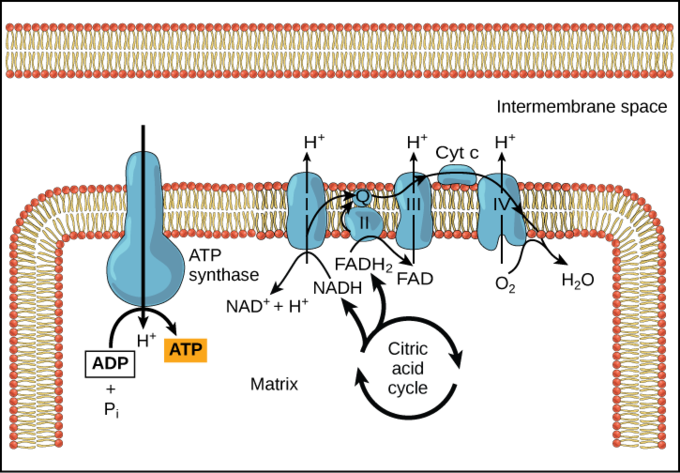 The most vital part of this process is the electron transport chain, which produces more ATP than any other part of cellular respiration. The electron transport chain is the final component of aerobic respiration and is the only part of glucose metabolism that uses atmospheric oxygen. Electron transport is a series of redox reactions that resemble a relay race. Electrons are passed rapidly from one component to the next to the endpoint of the chain, where the electrons reduce molecular oxygen, producing water. This requirement for oxygen in the final stages of the chain can be seen in the overall equation for cellular respiration, which requires both glucose and oxygen. A complex is a structure consisting of a central atom, molecule, or protein weakly connected to surrounding atoms, molecules, or proteins. The electron transport chain is an aggregation of four of these complexes (labeled I through IV), together with associated mobile electron carriers. The electron transport chain is present in multiple copies in the inner mitochondrial membrane of eukaryotes and the plasma membrane of prokaryotes. The electron transport chain: The electron transport chain is a series of electron transporters embedded in the inner mitochondrial membrane that shuttles electrons from NADH and FADH2 to molecular oxygen. In the process, protons are pumped from the mitochondrial matrix to the intermembrane space, and oxygen is reduced to form water. To start, two electrons are carried to the first complex aboard NADH. Complex I is composed of flavin mononucleotide (FMN) and an enzyme containing iron-sulfur (Fe-S). FMN, which is derived from vitamin B2 (also called riboflavin), is one of several prosthetic groups or co-factors in the electron transport chain. A prosthetic group is a non-protein molecule required for the activity of a protein. Prosthetic groups can be organic or inorganic and are non-peptide molecules bound to a protein that facilitate its function. Prosthetic groups include co-enzymes, which are the prosthetic groups of enzymes. The enzyme in complex I is NADH dehydrogenase, a very large protein containing 45 amino acid chains. Complex I can pump four hydrogen ions across the membrane from the matrix into the intermembrane space; it is in this way that the hydrogen ion gradient is established and maintained between the two compartments separated by the inner mitochondrial membrane. Complex II directly receives FADH2, which does not pass through complex I. The compound connecting the first and second complexes to the third is ubiquinone (Q). The Q molecule is lipid soluble and freely moves through the hydrophobic core of the membrane. Once it is reduced to QH2, ubiquinone delivers its electrons to the next complex in the electron transport chain. Q receives the electrons derived from NADH from complex I and the electrons derived from FADH2 from complex II, including succinate dehydrogenase. This enzyme and FADH2 form a small complex that delivers electrons directly to the electron transport chain, bypassing the first complex. Since these electrons bypass, and thus do not energize, the proton pump in the first complex, fewer ATP molecules are made from the FADH2 electrons. The number of ATP molecules ultimately obtained is directly proportional to the number of protons pumped across the inner mitochondrial membrane. The third complex is composed of cytochrome b, another Fe-S protein, Rieske center (2Fe-2S center), and cytochrome c proteins; this complex is also called cytochrome oxidoreductase. Cytochrome proteins have a prosthetic heme group. The heme molecule is similar to the heme in hemoglobin, but it carries electrons, not oxygen. As a result, the iron ion at its core is reduced and oxidized as it passes the electrons, fluctuating between different oxidation states: Fe2+ (reduced) and Fe3+ (oxidized). The heme molecules in the cytochromes have slightly different characteristics due to the effects of the different proteins binding them, which makes each complex. Complex III pumps protons through the membrane and passes its electrons to cytochrome c for transport to the fourth complex of proteins and enzymes. Cytochrome c is the acceptor of electrons from Q; however, whereas Q carries pairs of electrons, cytochrome c can accept only one at a time. The fourth complex is composed of cytochrome proteins c, a, and a3. This complex contains two heme groups (one in each of the cytochromes a and a3) and three copper ions (a pair of CuA and one CuB in cytochrome a3). The cytochromes hold an oxygen molecule very tightly between the iron and copper ions until the oxygen is completely reduced. The reduced oxygen then picks up two hydrogen ions from the surrounding medium to produce water (H2O). The removal of the hydrogen ions from the system also contributes to the ion gradient used in the process of chemiosmosis. Chemiosmosis is the movement of ions across a selectively permeable membrane, down their electrochemical gradient. During chemiosmosis, the free energy from the series of reactions that make up the electron transport chain is used to pump hydrogen ions across the membrane, establishing an electrochemical gradient. Hydrogen ions in the matrix space can only pass through the inner mitochondrial membrane through a membrane protein called ATP synthase. 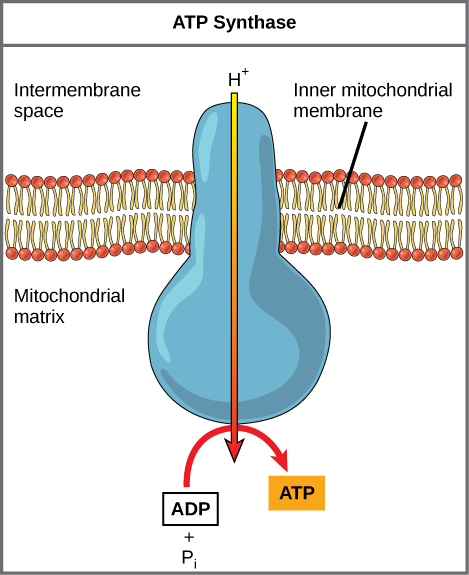 As protons move through ATP synthase, ADP is turned into ATP. The production of ATP using the process of chemiosmosis in mitochondria is called oxidative phosphorylation. ATP synthase: An important enzyme that provides energy for the cell to use through the synthesis of adenosine triphosphate (ATP). oxidative phosphorylation: A metabolic pathway that uses energy released by the oxidation of nutrients to produce adenosine triphosphate (ATP). chemiosmosis: The movement of ions across a selectively permeable membrane, down their electrochemical gradient. During chemiosmosis, electron carriers like NADH and FADH donate electrons to the electron transport chain. The electrons cause conformation changes in the shapes of the proteins to pump H+ across a selectively permeable cell membrane. The uneven distribution of H+ ions across the membrane establishes both concentration and electrical gradients (thus, an electrochemical gradient) owing to the hydrogen ions’ positive charge and their aggregation on one side of the membrane. Chemiosmosis: In oxidative phosphorylation, the hydrogen ion gradient formed by the electron transport chain is used by ATP synthase to form ATP. If the membrane were open to diffusion by the hydrogen ions, the ions would tend to spontaneously diffuse back across into the matrix, driven by their electrochemical gradient. However, many ions cannot diffuse through the nonpolar regions of phospholipid membranes without the aid of ion channels. Similarly, hydrogen ions in the matrix space can only pass through the inner mitochondrial membrane through a membrane protein called ATP synthase. This protein acts as a tiny generator turned by the force of the hydrogen ions diffusing through it, down their electrochemical gradient. The turning of this molecular machine harnesses the potential energy stored in the hydrogen ion gradient to add a phosphate to ADP, forming ATP. ATP Synthase: ATP synthase is a complex, molecular machine that uses a proton (H+) gradient to form ATP from ADP and inorganic phosphate (Pi). Chemiosmosis is used to generate 90 percent of the ATP made during aerobic glucose catabolism. The production of ATP using the process of chemiosmosis in mitochondria is called oxidative phosphorylation. It is also the method used in the light reactions of photosynthesis to harness the energy of sunlight in the process of photophosphorylation. The overall result of these reactions is the production of ATP from the energy of the electrons removed from hydrogen atoms. These atoms were originally part of a glucose molecule. At the end of the pathway, the electrons are used to reduce an oxygen molecule to oxygen ions. The extra electrons on the oxygen attract hydrogen ions (protons) from the surrounding medium and water is formed. The amount of energy (as ATP) gained from glucose catabolism varies across species and depends on other related cellular processes. While glucose catabolism always produces energy, the amount of energy (in terms of ATP equivalents) produced can vary, especially across different species. 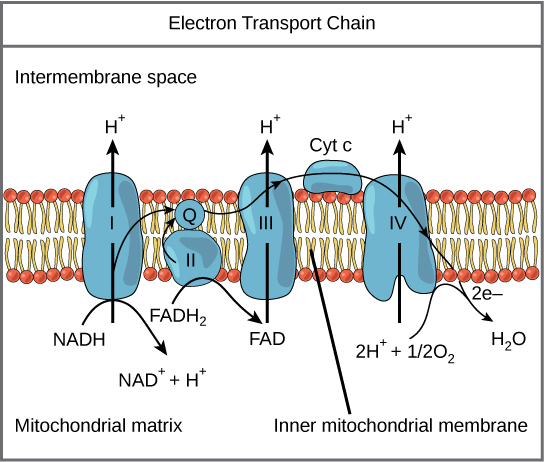 The number of hydrogen ions the electron transport chain complexes can pump through the membrane varies between species. NAD+ provides more ATP than FAD+ in the electron transport chain and can lead to variance in ATP production. The use of intermediates from glucose catabolism in other biosynthetic pathways, such as amino acid synthesis, can lower the yield of ATP. catabolism: Destructive metabolism, usually including the release of energy and breakdown of materials. In a eukaryotic cell, the process of cellular respiration can metabolize one molecule of glucose into 30 to 32 ATP. The process of glycolysis only produces two ATP, while all the rest are produced during the electron transport chain. Clearly, the electron transport chain is vastly more efficient, but it can only be carried out in the presence of oxygen. 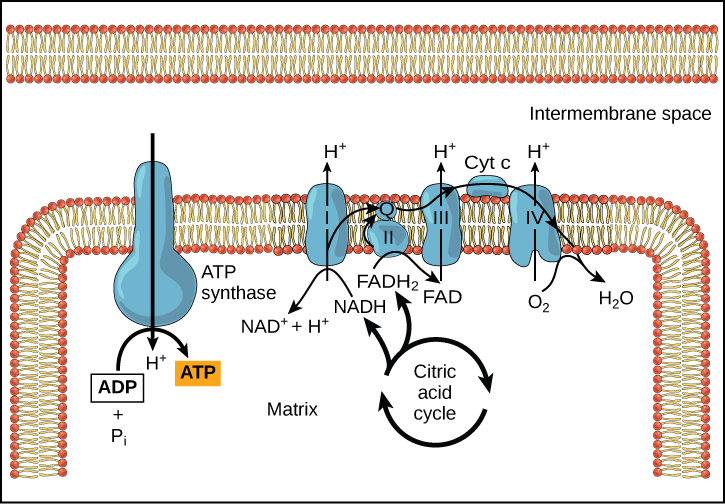 Cellular respiration in a eukaryotic cell: Glycolysis on the left portion of this illustration can be seen to yield 2 ATP molecules, while the Electron Transport Chain portion at the upper right will yield the remaining 30-32 ATP molecules under the presence of oxygen. The number of ATP molecules generated via the catabolism of glucose can vary substantially. For example, the number of hydrogen ions the electron transport chain complexes can pump through the membrane varies between species. Another source of variance occurs during the shuttle of electrons across the membranes of the mitochondria. The NADH generated from glycolysis cannot easily enter mitochondria. Thus, electrons are picked up on the inside of mitochondria by either NAD+ or FAD+. These FAD+ molecules can transport fewer ions; consequently, fewer ATP molecules are generated when FAD+ acts as a carrier. NAD+ is used as the electron transporter in the liver, and FAD+ acts in the brain. Adenosine triphosphate: ATP is the main source of energy in many living organisms. Another factor that affects the yield of ATP molecules generated from glucose is the fact that intermediate compounds in these pathways are used for other purposes. Glucose catabolism connects with the pathways that build or break down all other biochemical compounds in cells, but the result is not always ideal. For example, sugars other than glucose are fed into the glycolytic pathway for energy extraction. 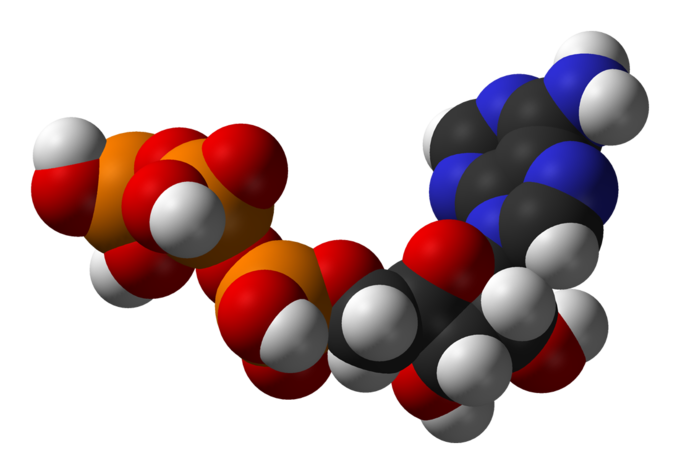 Moreover, the five-carbon sugars that form nucleic acids are made from intermediates in glycolysis. 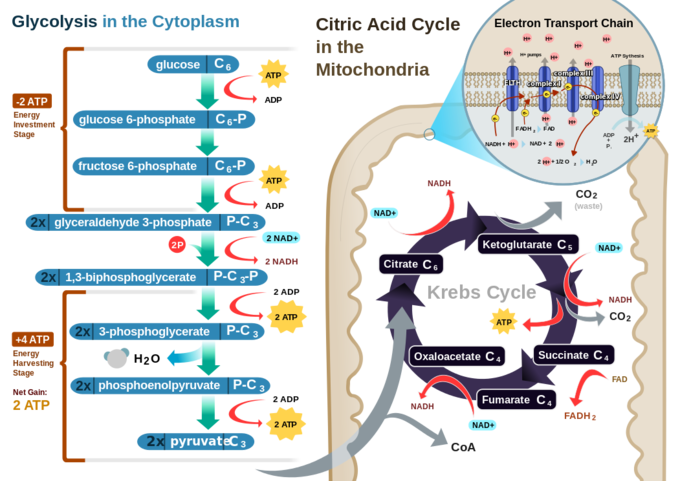 Certain nonessential amino acids can be made from intermediates of both glycolysis and the citric acid cycle. Lipids, such as cholesterol and triglycerides, are also made from intermediates in these pathways, and both amino acids and triglycerides are broken down for energy through these pathways. Overall, in living systems, these pathways of glucose catabolism extract about 34 percent of the energy contained in glucose.